Family is important. But at the same time, we all understand that not all of our family are related by birth. As a result of marriage, we gain people into our lives, whom we call family and then there are those of whom we grow up with and share our lives with, who we are not related to either by birth or by marriage, but through shared experience and friendship who we also refer to as family. During a trip to San Sebastian or Donostia in Spain, where some of my wife’s family are from, I had the unique opportunity of being able to visit a side of San Sebastian that few tourists get to see and experience. And it doing so, I was able to witness first hand how food, no matter where you are in the world brings people together and greases the wheels that bond the informal family of friends together. 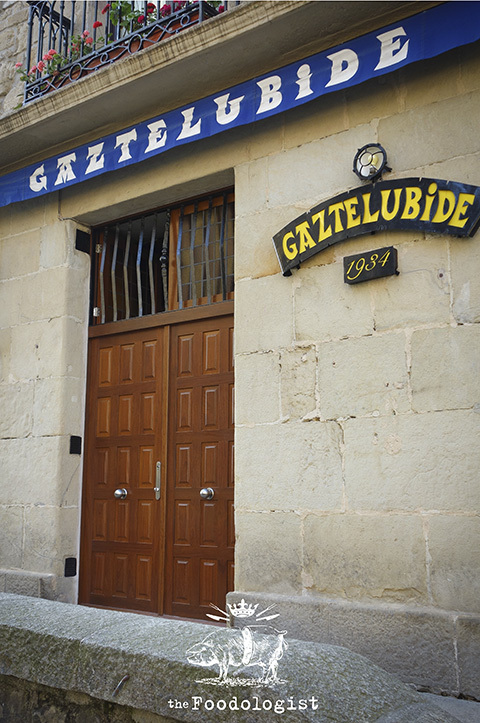 Gaztelubide is one of San Sebastian’s Gastronomic societies which is known in Basque as a ‘Txoko’. 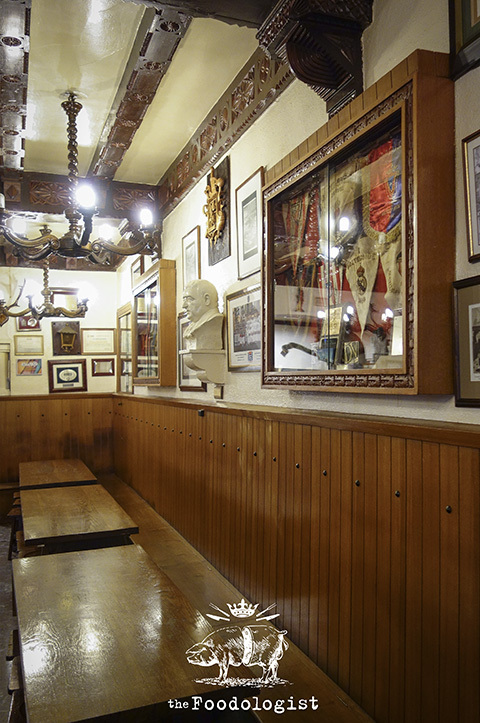 Unlike a typical ‘Gentlemen’s Club’ which are have a strong sense of hierarchy and bounded by rules and regulations, Txoko are Gastronomic societies which serve as meeting places where men of all social classes, usually in groups of friends (who have typically been friends since childhood) called ‘Cuadrilla’ go to cook, eat and socialise. Records of the earliest Txoko go back to the 1870′s in San Sebastian. Women are traditionally not allowed but now some Txoko allow women in to eat but not to cook. It is said in common vernacular that it is rude to speak of either politics or religion at the dining table and one such typical rule at a Txoko is that political talk is not allowed. This is also perhaps reflective of the divisive nature of politics in the region. One of my wife’s cousins is a member of one such establishment as my interest in food and gastronomy was known before our arrival, it was arranged that I would be invited to share a meal with our family member and his cuadrilla. The building itself is relatively simple, yet upon entering, the sense of tradition is evident. Photo’s adorn the walls of previous members and officers of the society as well as flags, busts of important members and other memorabilia. The main dining area is complete with long tables and benches where members dine together. Members of the society pay monthly or yearly fees which account for rent and/or upkeep on the facility. 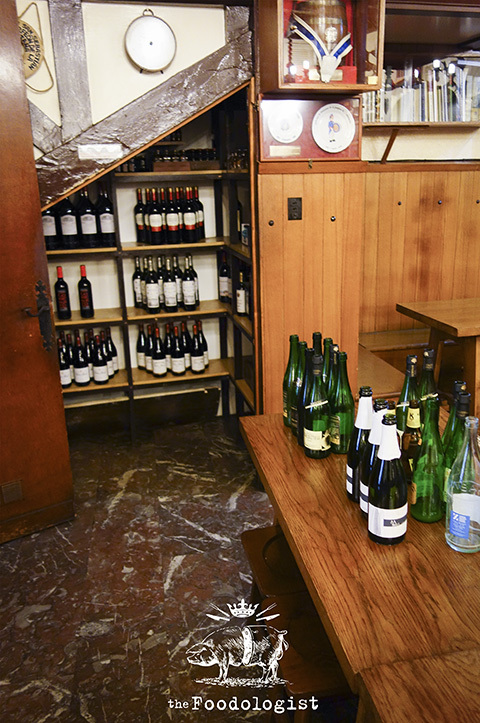 Additionally an honour system operates for drinks and a well stocked drinks cupboard is available for the use of members. It was interesting to see what we would typically call a ‘money jar’ in the dining room which was originally used for the collection of money where members paid for their drinks. 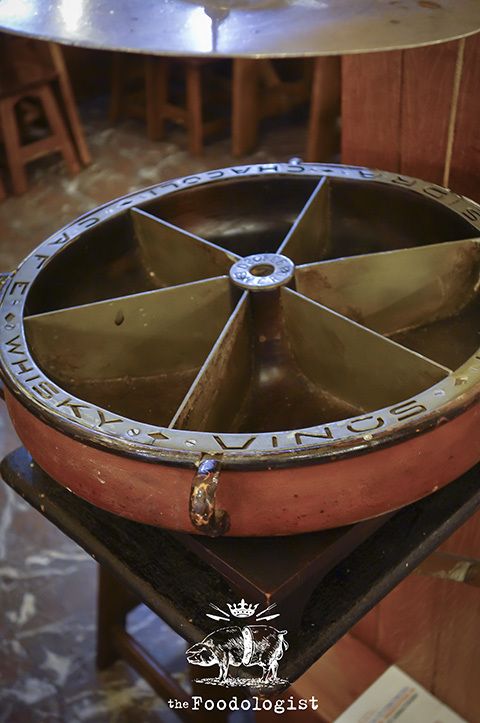 This piece was specifically designed for the club and although not in use anymore, it is still on show in the dining room. One can see where members put money for coffee, whisky, wine or the local drink Txakoli. 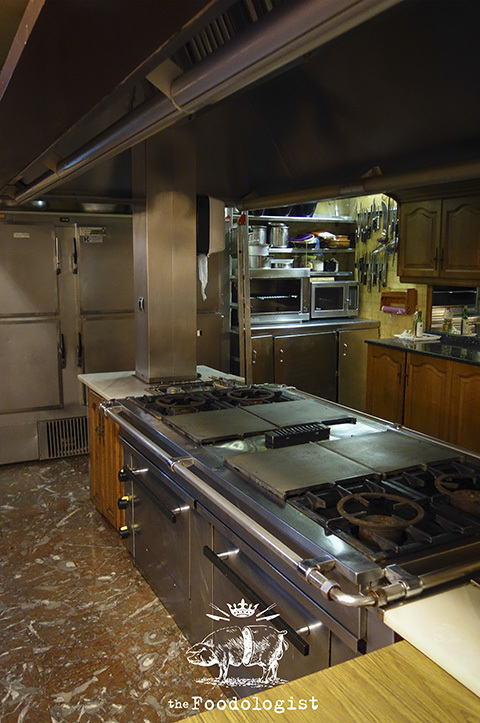 The kitchen was very well appointed and is able to either cater for a number of groups of people wanting to cook separately or for much larger groups cooked by one group. Whilst we were there that evening, there were two groups of friends dining in. In the group that I was with, there were approximately twelve of us. They each take it in turns to cook either alone or in smaller groups. My host tells me that the man cooking tonight is his oldest and dearest friend from childhood. As he prepares our dinner, I am told to sit down and I start to find out a little more about the people in this club. 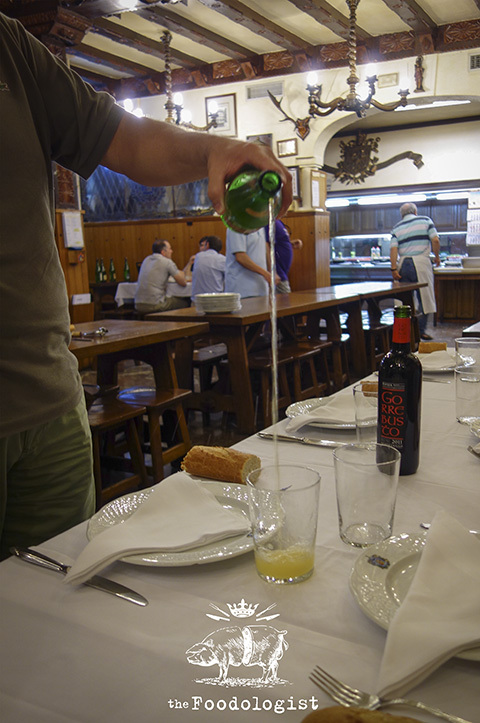 As I sit down, one member of the group pours me a glass of ‘Txakoli’ which is a dry white wine local to the Basque region. It is very slightly sparkling and a little acidic and when poured, it is poured from a relatively decent height into glasses in very small amounts, just a few sips worth. Pouring from this distance activates the bubbles within the drink and leaving the drink to sit allows the drink to go flat. As a result, when someone pours you some Txakoli, you are expected to drink it immediately. I notice as we wait for our meal that my glass is re-filled on a constant basis and we begin to comfortably settle in to the evenings festivities. My Spanish is very limited and my Basque is non-existent and the gentlemen here tonight are not all fluent in English but as is usually the way when foreigners meet, we find ways to communicate in a combination of Spanish, English, Basque and awkward sign language. When I ask what do their wives think of this ‘boys club’, one of the men, a tall man with a French name, tells me that ‘he only goes once a week to the club…but EVERY week’. The other gentlemen laugh at his comment and agree with him and more Txakoli is poured around the table before the first course is served. 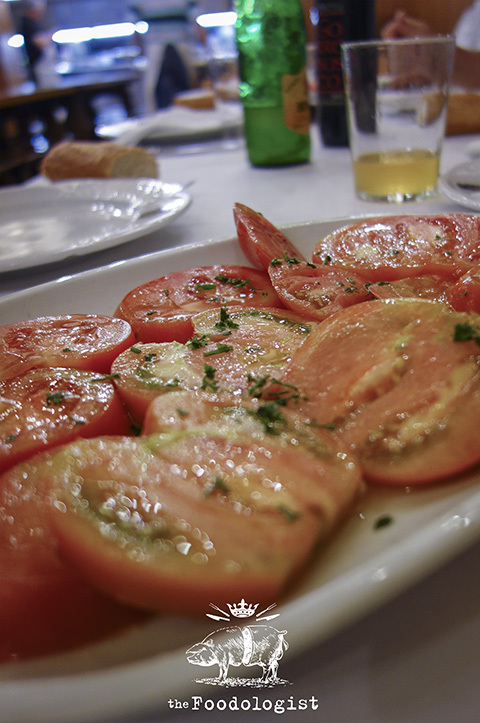 As it is a hot night, the first course is simply a tomato salad. Typical in Basque cooking, the names of dishes and lists of ingredients never quite do the food justice and this dish was no exception. The quality of flavour from the tomatoes alone are not something we are typically used to here in Australia. They had a very prominent umami overtones and had the flavour reminiscent of a perfectly ripe tomato yet a firmness of the flesh that held together unlike some of the watery mush we have become accustomed to here. The dressing was predominantly salt, some sort of vinegar (presumably sherry), olive oil and garlic, lots of garlic. Chunks of baguette were handed around and the group continued to talk, eat and drink. As the evening continued, I learnt that most of the group were part of the societies choir which had practiced earlier that day and I without understanding the content of the conversation, it was easy to pick up its tone. Some of them argued and then laughed and some of them teased each other but all of them made their best effort to make me feel welcome that evening partly out of courtesy to me and partly out of respect for their friend, my host. The main course arrived which was a fish stew. 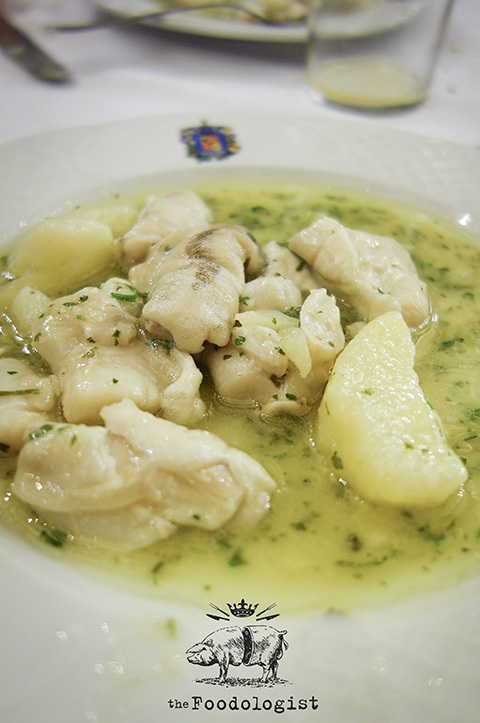 I had initially thought that we were perhaps being given Cod Cheeks as the meat was slightly gelatinous but upon questioning, I was informed it was another type of fish who’s name was quickly lost amidst the conversation and Txakoli. 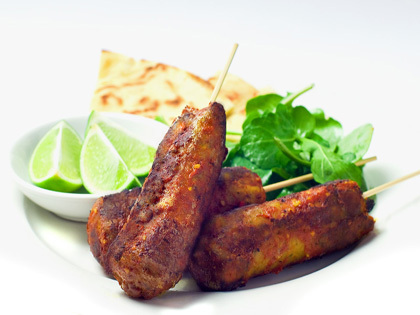 Again, garlic and parsley played a key role in the flavouring whilst potatoes provided substance. Like the previous course, bread was handed out and we mopped up the sauce before wiping our chins and continuing the evening both relaxed and content. After the meal, the plates were cleared but the drinks continued. Dessert was a mixed affair, simply a fruit salad which some ate and some didn’t. Some of the group looked on sadly at those who ate the dessert and complained about their diabetes and their doctor and reminisced about times long gone. More drink flowed and one of the group made their way to a piano in the corner of the room and the others began to sing. I didn’t know what the songs were about but I was encouraged to join in. I did pick up a couple of words and contributed a few lines at roughly appropriate times in a way only an awkward Western tourist can. They jumped and whooped and continued to sing for a while longer before sitting down again where the talk continued and the laughter got louder. It brought home the realisation of how similar we are, no matter where we are. Shared experiences at the dining table are the very heart of conviviality and these gentlemen understood it all too well. They had welcomed me in, not just to see what happens in their society but into their lives for just one evening. In doing so, I gained a insight into the lives of a group of people who lived a world away from me. Whilst not family by birth or through marriage, they were family through friendship and they celebrated these familial bonds weekly through their ties to this society. It was an experience that I’m not sure I will ever get to have again, but it is an experience that I will never forget. What an amazing experience for you to have, George, and such a unique one. I’m glad to hear that political talk is banned in these places. Given the history of the region it wouldn’t take much for an evening to get very ugly, very quickly, if it was allowed.